Endeavor Plumbing provides its high calibre plumbing services to all those who dwell in the Brighton area. 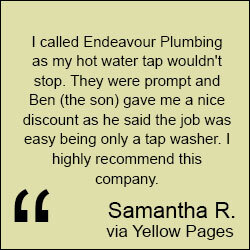 Why Choose Endeavour Plumbing for your Brighton Home? Plumbing systems and their respective appliances get more use than any other devices in any household or establishment. Their extensive use makes them incredibly prone to break down and present defects. Due to this, Endeavor Plumbing is the perfect team to handle any plumbing needs that emerge unexpectedly. We benefit from being well informed on the requirements of various settings, due to the wide array of clients that we have serviced over the years. We have worked on projects that have involved every kind of plumbing need in the book. In addition to our availability, we place a great deal of attention on keeping our customer base happy. No matter what issue in in place, we strive to be the reliable plumbing service that all consumers look to for their needs. Our high level of professionalism sets us apart from the rest; We handle all business activity with integrity, placing our client’s best interests at the top of our list. All of our plumbers are properly trained and keen on remaining informative and resourceful throughout the completion of any job they may be involved in. We guarantee that our services will exceed your expectations and that our pricing will reflect the value of the work we perform. We have experience with regular maintenance, general plumbing, drain blockage, pipe laying, and much more. Plumbing accidents and requirements often take place in a sporadic nature, our team is prepared to handle a call at any moment. We have our plumbers available around the clock, 24/7 just in case an emergency comes up. If you are interested in plumbing services in Brighton contact us through our website or give us a call. One of our plumbing experts will be happy to help you with all your plumbing needs! We also provide plumbing services in Metro and surrounding suburbs such as our plumbing services in Malvern, if you're looking for the quickest service speak to our expert plumbers today.